Aa a private citizen I began speaking up in Public Comment in Legislative Committee meetings. My goal was to speak to things for the people. I have done that at home in Bondurant. The local Service Improvement District set about a path of deceiving the people in 2013. 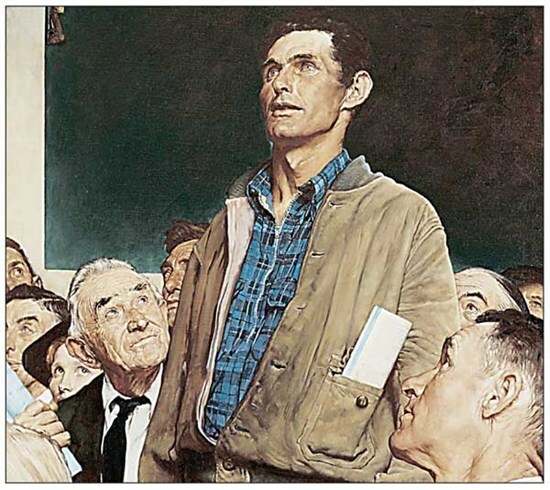 I've spoken up to this board like this man in the Norman Rockwell painting. In my mind he's standing up to say that "the Emperor has no clothes on." What I saw in this Service and Improvement District taught me that government without limits must be reined in. It is the Legislature's duty to provide sufficient framing statutes to corral such behavior. In the Nuclear Submarine world education is everything. I have observed my wife, Louise, teach many places around the world. I have followed education in Wyoming closely. • Education is our future. Our system has too many paper-pushers. •• There is at least $50M being spent on too many administrators. I have oberved my wife in Wyoming. • I believe women are not compensated equally.